A far cry from Tortilla Flat, with none of the originality and sardonic humor of that delightful book. But this qualifies for recognition on the score of being much-better-than-average proletarian novel (of which there are chiefly below average books). The setting is a fruit growing district in California -- the story revolves around the deliberate and almost fanatical machinations of red agents to foment discontent and to organize strikes. 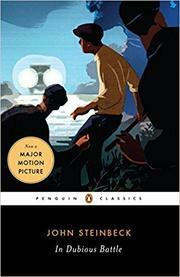 It is extraordinary how Steinbeck succeeds in swinging the sympathy with the agent and his young apprentice, in building understanding of the methods employed, of showing how the side of convention twists and distorts facts and creates false evidence, establishing disturbance where there was simply quiet and grim determination. Almost one grows to accept the inevitability of eliminating the human equation. A book for those interested in Left Wing literature -- and those concerned with new trends.